How many experiences this place has brought to me! How many challenges, opportunities, hurdles, and fun. The last three years in Oxford have quite simply been some of the best of my life – and scribbling these few words conjure up the warmest of memories – and I haven’t even left yet! It is a strange place, Oxford. You arrive full of preconceptions and presuppositions about what the place should look and feel like – well, in that sense not quite unlike the feeling one would get prior to moving anywhere new. 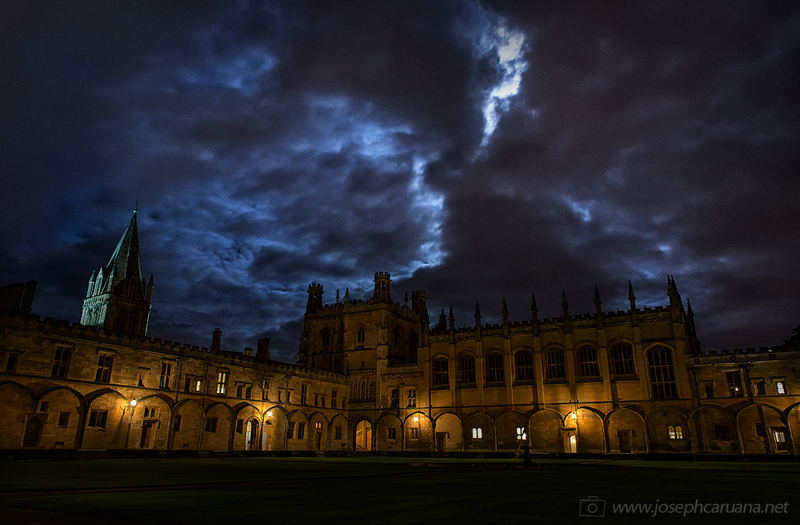 But there is something different about Oxford, or at least, something felt different to me. The ancient buildings, the age-old traditions, the palpable atmosphere of learning, the timelessness of the place: they were all fantastically bewildering and initially even too amusing to be true. But then one settles in, and before long, what once seemed to be the material of anecdotal stories and wondrous dreams becomes everyday life. Not that the magic was ever lost – to the contrary, up until this very moment I can think of so many sights that I would love to photograph, had I the luxury of even more time – not to mention the right conditions. For this reason, I had always expected that choosing a picture which, upon my leaving, would in some way record Oxford in the way my mind had always perceived it would be a difficult task. You see, this was a thought that had preoccupied my mind ever since I arrived here. I always used to ask myself: Were I to leave Oxford right now, at this very moment, do I have a picture which I could forever treasure as signifying Oxford for me? It had to be a photograph that anyone could respond to in some way, but one that was also personal. I wanted it to be first and foremost defined by the place, and not by my own creative process. So neither an abstract nor a very “inventive” portrayal. I wanted it to be both true and unreal. Well, I think I’ve known all along that ultimately it had to be a picture of the unchanging architecture of the place, whilst somehow displaying something that was fleeting in time, signifying a particular moment, in an almost serendipitous manner. That way it could be timeless on the one hand, ingrained in time on the other. It seemed more and more likely that the unpredictable British weather (with which I’ve had a most variable relationship) had to play a major role. I never had a specific picture in mind – it has always been more about the feeling it would convey than the actual content. As long as it “felt right”, then it would be a good picture. Hopefully, the opportunity would present itself at some point. The problem was that as time went by, the less likely it seemed that I would ever content myself. I remember the many evenings when I’d hurry from the department to college, leave my photography bag in the locker, put on the gown and rush to hall for dinner with college friends. I remember the many hours spent in this very same quad, camera in hand, hoping to capture something different as the seasons went by – from menacing clouds to bright sunshine and colourful rainbows. I remember the very first time I entered the Great Hall for formal dinner, awed by the sight of a sea of gowns worn by countless students whose faces were lit by amber-glowing lamps, whilst someone uttered Latin Grace. (What a fantastic picture this would make, I thought to myself!) I remember the many late hours spent working in the study room and the incredibly rewarding experience I had teaching some very keen undergraduates (which involved doubling my hot-chocolate dosage whilst marking their solutions to general relativity problems at ungodly hours). I remember reading and re-reading Einstein’s poem hanging on the wall in the Graduate Common room, which he wrote when he was once here in the same college. I also remember how I grew accustomed to the many serious portraits of long-dead people looking upon us over dinner every evening – Locke, Boyle, Gladstone, Dodgson, and many others. And then of course there were the times when my mind was preoccupied by how I was going to get rid of cosmic rays in my data, all the time trying to detect that most feeble a signal from the furthest depths of space. There also were the Summers full of travelling for conferences, meetings and observing trips – always returning to the same warm (in character, not temperature-wise!) and comforting place. I remember sitting in Tom Quad gazing at Orion rising high above the Cathedral or the moon peeking from behind the clouds. Above all, I’m reminded of the large number of friendships forged over the last three years and the many special people who have most certainly left their mark. I’ll have to keep coming back here; after all there are still a few photographs I’d like to snap, and then some. (Oh, and I have yet to submit, and sit for the viva!) So let me be honest – this won’t be the last picture after all. Thanks to all for having made Oxford so special! You all know who you are because I’m sure you are reading this. This one is dedicated to you all. Hmm… I think I really am happy with this picture!